LED Bollard lights are a great way to bring your garden or pathway to life. They’re available in many different shapes, styles, and finishes, so we don’t you’ll be able to find something that’s completely suitable for the style of your home. See other products in our exterior lighting range. These low-level lights offer lighting where it's needed in a stylish manner. First Lighting has a wide variety of products and finishes with bollard lighting, making a feature thanks to their economical value. These fixtures are set to propel your paths and walkways outside of your home, giving an elegant finish whether you choose a contemporary or more traditional design. Alter the style of your garden with First Lighting’s range of tasteful bollard lights that not only provide illumination where needed but elegance to your property too. These lights are ideal lighting for where there is no suitable place for a wall light. The larger designs can help create dramatic entrances to your home when lining paths and drives. 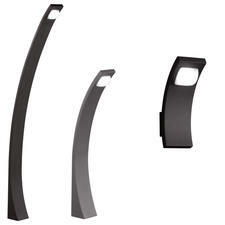 Or you could use a smaller fitting to provide discreet lighting, creating unobtrusive ambient lighting. 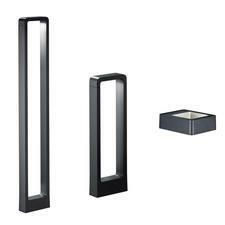 They are perfect for lighting up pathways offering practical safety as well as tasteful charm to the exterior of your home. LED Bollard Lights are a great option as the bulbs last longer so they’re less expensive to run and the light is less harsh too. This is because they use low voltage LEDs. 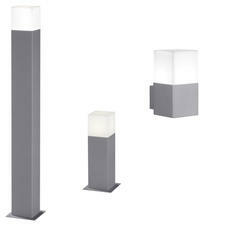 Ideal if you’re using the garden bollard lights to create a calming and relaxing atmosphere in your space. There are a number of different styles to choose from when it comes to bollard lights, a fixed head design throws the light down onto a path or driveway with no direct glare. But you could also give the light a wider berth without any glare shielding. Short bollards can be used for low-level pathway markers or driveway entrance lights. Taller, slim designs are ideal to be used around patio areas. These light fittings are made from high-quality materials that are hardwearing and long lasting. These lights are durable and rainproof, allowing you to install the lights where you need illumination, rather than just where there is a suitable shelter. First Lighting is on hand to offer a wide range of exterior bollard lights that are set to take your home into the future with their modern and stylish designs. Or propel it back to the past with their rustic and elegant designs. Whichever style you want we have the high-quality products you need.